It’s by some coincidence that the first two films I’m reviewing are both about a young brother and sister combo, pitted against an older, seemingly more responsible adult. Granted, the use of children in horror movies is not uncommon, I’m guessing because the things we’re most scared of we were most scared of when we were kids. Also, The Innocents (ironically) isn’t about kids that are necessarily naive and innocent, but instead the adult is the one getting spooked out of their gourd. The particular adult I’m talking about, Miss Giddens (played by Deborah Kerr), has applied to be a governess (which seems to be the British version of a nanny), for these two orphan children. She’s given the job by the children’s guardian, a middle-aged bachelor (Michael Redgrave), who’s basically like “I don’t really feel like taking care of these kids, because I’m all about partyin’ and trottin’ the globe,” except he says it, you know, way more British. Miss Giddens then arrives at the estate where the children reside, and seems to take a liking to them, but soon finds there is something haunting the grounds, and these kids appear to know something about it. In my review, I know I alluded to the fact that the kids in The Night of The Hunter don’t leave much an impact. Meanwhile, the kids in The Innocents (played by Martin Stephens and Pamela Franklin) are quite good. Stephens in particularly has this very sophisticated (for an 8-year old) demeanor to him, which basically makes him come off as a Victorian Young Sheldon. So while you’re watching him, you’re not sure if you want to strangle him or feel sorry for him, as you see that there are some skeletons clearly lurking in the closet of his family’s sordid past. Also, much like The Night Of The Hunter, this is another film where much of the film’s eery vibe relies heavily on its sound design and particularly on its cinematography. Here you can definitely feel the influence of Ingmar Bergman and his cinematographer Sven Nyquvist that had taken hold of European cinema at the time. 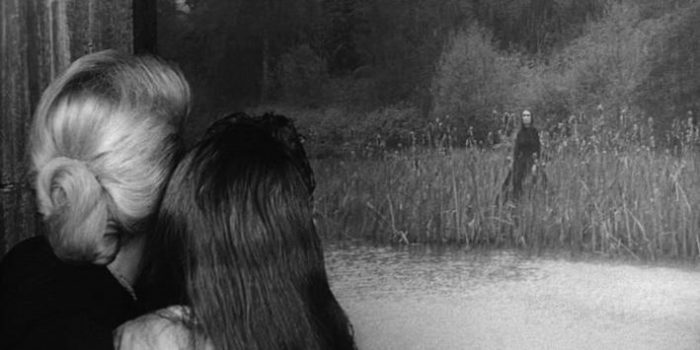 Because in addition to its 19th-century rustic setting, the film’s imagery is filled with lots of deep focus and faces in the background being juxtaposed strikingly against faces in the foreground. I know, it’s not nearly as fun to hear someone talk about great cinematography rather than seeing it, but it’s also hard to talk about a film were a lot of the questions regarding the plot stay vague, and never are really fully answered. But the subtle imagery makes it work, which is much in part due to cinematographer Freddie Francis, who would go on to direct Shocktober favorites like Tales From The Crypt, and, er, Trog. Speaking of which, this is another reminder that I should probably watch more British horror movies. From what little British horror I’ve seen, it seems pretty apparent that the Brits are prone to a much more buttoned-down type of horror, in which we’re treated less to out-and-out scares, and more to a kind of sinisterness lurking beneath the veneer of mundane everyday life. And as The Innocents shows, if you try to repress that sinisterness, it’ll eat away at you until it’s too late.